NEW YORK (CNN) -- The pace of economic decline slowed substantially in the second quarter, as the U.S. economy shrank at an annual rate of 1 percent, far less than it did in the first quarter, according to a government report released Friday. Economists surveyed on Briefing.com expected the second-quarter reading to show the economy contracted at an annual rate of 1.5 percent. Lakshman Achuthan, managing director of the Economic Cycle Research Institute, expects the recession to come to an end this summer. He noted that GDP is a trailing indicator but said the change in direction suggests that the worst is behind us. CNN spoke to author and foreign affairs analyst Fareed Zakaria about the economic situation in the US and around the world. CNN: Is it true the economy is finally recovering? Fareed Zakaria: A key statistic was released this week that has garnered a lot of attention -- front page coverage in both the New York Times and the Wall Street Journal -- because it does seem to indicate some kind of bottom. The Case-Shiller price index showed the decline in the American housing market seems to have ended. CNN: Why is that such big news? 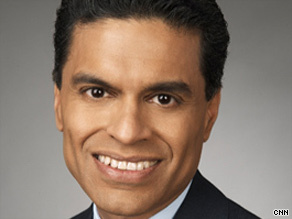 Zakaria: Remember, the decline of the housing market has been the single largest cause of the current recession. Even the financial crisis was precipitated by falling home prices, which put all those subprime mortgages in a downward spiral. Fareed Zakaria talks to two leading contenders to be the next president of Afghanistan on this week's "GPS." So the stabilization of this market could well mean the beginnings of a recovery. But it will only set the stage for a genuine recovery if American consumers are willing to spend again. That's the key. CNN: In a global recession, can the American consumer really be that important? Zakaria: Yes. A lot has been written about how emerging markets has prevented the global economy from tanking completely. That's all true. However, while the economies of China, India, Brazil and Indonesia have prevented a complete global free fall, for a broad recovery, the American consumer has to start spending again. To understand his role and power in the world economy, just look at the figures. The American consumer currently equals the total economy of China plus India doubled. It's the single biggest piece of the global economy. CNN: We are seeing some tentative good news on the housing front, but will it translate to other areas? Zakaria: Historically most recoveries begin with a stabilization of the housing market, followed by automobiles, appliances and then other consumer categories. But this might not be a normal recession and recovery. Zakaria: Because we entered this recession with massive debt. American consumers maxed out and are slowing paying off their debts: mortgages, credit cards, etc. Niall Ferguson, a frequent guest on "GPS, "says that we are entering an age of deleveraging, as households rebuild their balance sheets. CNN: You pointed to the Case-Shiller index at the beginning. Is there another statistic that will tell us when consumers will start spending again? Maybe when we hit a certain savings rate? Zakaria: Americans will spend again. But when? When the country hits a savings rate of 8 percent or 9 percent or 12 percent? I don't know, and the differences in those figures are huge -- in terms of the effect on the overall economy. The key to understanding when we will experience a real recovery lies not in a set of hard economic facts but a very soft question: When will Americans feel confident and secure enough about the future that they will start spending again? The fate of the global economy rests on the answer to what is ultimately a matter of human psychology.